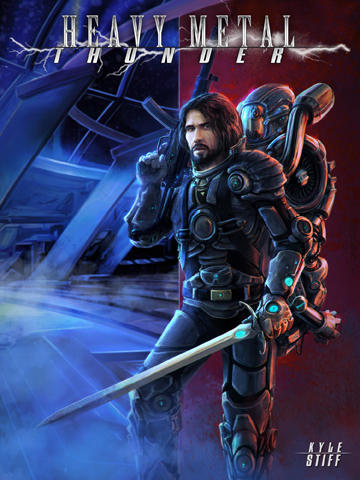 Heavy Metal Thunder is a brilliant Kindle gamebook by Kyle B Stiff set in the far future where you are an amnesiac freedom fighter trying to get home. The book is available for Kindle for £1.94 or $3.04 and at that price you would have to be mad not to buy it. The Kindle edition is hyperlinked so that you do not have to search through the book making gameplay very convenient, so you can be happy about that. The story is set in the Solar System in the far future where every possible thing has been discovered and every possible style of art, music and culture has been tried to all of their possible permutations and so humanity has fallen into a state of decadence and apathy thus allowing themselves to be easily conquered by a horde of invading aliens. You are a member of the resistance, a conditioned and highly trained super soldier who awakes on a station with no memory of who they are. This book is all about returning home and on the way, you encounter all kinds of insanity from the manager of the space station to poetic navigators to the man who tried to kill you. You manage to earn yourself a new name (no more Mr Wiggles for you). The book is written with much madness and humour but none of it detracts from the gameplay which is a huge difficult to avoid trap where humour in gamebooks is concerned so Kyle should get a great mark for that alone. However, there is so much more in this book. The skills and and stats also fit in well with the universe presented, allowing you to take such skills as xenology, navigation and piloting. The cover image, by Oliver Wetter is very badass and it goes very well with the badass title. There are no other illustrations but there is plenty of backstory to get immersed in. The book has a very detailed history of humanity and also gives a lot of detail of the space stations you visit or ships that you are on. There are also a lot of great descriptions of battles. Combat is well thought out and is logical within the universe of the book. You have plenty to explore in the book and you have plenty of choices from exploring the station at the beginning to exploring the strange objecct in space to giving interviews to people who want to be on your space ship crew to fighting the final battle. Some choices are better than others but there are no arbitrary deaths done for the sake of a joke, so you have the freedom to explore. Kyle also adds regeneration points so if you die, you don't have to go back to the beginning of the book and tells you that using the rules aren't necessary if you just want to play the book like a Choose Your Own Adventure book. The book is very convergent as you play through certain set pieces before coming to the next point in the book and this makes the book very replayable. the book is full of madness and humour, some of it crude but all of it funny, and, as I have already said, none of the jokes are made at the expense of the gameplay. Paragraphs are nice and full with plenty of description and interaction with the various characters thet you will come across in the book. None of them are flat - everyone you come across will have an interesting story. The set pieces are all very enthralling whether you are exploring an abandoned space station, commanding a ship or fighting in the final battle where you meet the man who tried to kill you. The rules system is extensive and covers stats and several skills. There are several stats and skills to keep track of, but I can tell that Kyle knows gamebooks, because he tells you that you can throw all of these rules out and play the book as a Choose Your Own Adventure book. He also lets you have regeneration points that you can go back to if you die. The rules also allow progression and customisation of your character. If you do play by the rules, there is lots to keep track of, but you don't have to if you just fancy a read and that is very considerate of Kyle. Heavy Metal Thunder is an excellent gamebook with a great setting, larger than life characters and a fast paced storyline set in a mad universe. The best bit of it is that it is the first in a series and so there is plenty more to come. It was a brave move by Kyle to make a gamebook full of humour but Kyle manages to pull it off in a way that the humour does not lead to frustration. This is an excellent gamebook with a great storyline and a wonderful system and it only costs £1.94!